In December 2009, the CDC's National Center for Health Statistics reported the results of its National Ambulatory Medical Care Survey which included data on non-federal office-based physician use of EHR's. In line with other surveys, use of "fully functional" EHR's remains stubbornly low at 6.3%. 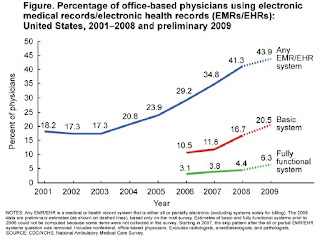 Use of basic systems rose to 20.5% and use of "any EMR/EHR system" has climbed to 43.9%. Basic systems include: "patient demographic information, patient problem lists, clinical notes, orders for prescriptions, and viewing laboratory and imaging results". Fully functional systems include the basics plus "medical history and follow-up, orders for tests, prescription and test orders sent electronically, warnings of drug interactions or contraindications, highlighting of out-of-range test levels, and reminders for guideline-based interventions." Guest author and Vice Chair of the HIT Standards Committee John Halamka provides an update on the HIT Standards Committee. At the January 20, 2010 meeting of the HIT Standards Committee, we had an important discussion of the Interim Final Rule and Notice of Proposed Rulemaking. Doug Fridsma presented this powerpoint about the Interim Final Rule. Slide 3 illustrates the linkage between Meaningful Use objectives, Certification criteria and standards. It's a 1:1 mapping - every objective has certification criteria. Every certification criteria has standard(s) requirements. Slides 5-8 document the differences between the HIT Standards Committee recommendations and the IFR. You'll see that most of the base standards recommendations from the HIT Standards Committee (based on a foundation of HITSP work) were included in the IFR. We discussed several key questions. Why does the IFR lack detailed implementation guidance? The IFR is a regulation, which means that the details provided in it are hard to change. By providing base standards but enabling implementation guidance to be published separately from the regulation itself, ONC allowed evolution and refinement of more specific guidance. Why does the IFR identify architectural approaches to transmission, REST and SOAP but not transaction orchestration? Will there be APIs developed by vendors, especially for routing patient summaries per the patient preference? ONC is trying to balance regulation and market forces, believing that PHR vendors will come together and create a common API for patient data transmission if it is required by meaningful use. Karen Trudel from CMS presented this powerpoint about Notice of Proposed Rulemaking. It contains many questions and requests for comment. The comment period closes March 15 and we'll see revisions of the NPRM that are directly related to comments. Likely most revisions will be deletions and changes, but if additions can be justified based on the comments, they are possible. Each Workgroup chair presented their workplaces for the next 6 weeks and the next 6 months. The workgroups will all make comments about the IFR to the entire HIT Standards Committee for its review at the February 24 meeting. The Committee will forward its consolidated comments to ONC by March 1. You'll see substantial work on vocabularies and implementation guidance including security/privacy over the next 6 months. The sense of the HIT Standards Committee is that ONC did a great job on a tight timeframe. The comment period will add the final polish. Checklists, the simplest of organizing tools, are making a big difference in healthcare. Atul Gawande's January 7th testimony before the President's Council of Advisors on Science and Technology highlighted many of the key findings and offered a classic exchange with the CEO of Google during Q&A. 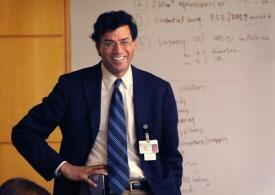 Gawande, surgeon, professor and New Yorker columnist has focused on checklists for some time. His latest book, The Checklist Manifesto, reports that thousands of hospitals have used checklists to reduce death rates by about one third (excerpt here). An article published in January 2009 by Gawande and colleagues evaluated surgical checklists internationally and found that "the rate of death was 1.5% before the checklist was introduced and declined to 0.8% afterward. Inpatient complications occurred in 11.0% of patients at baseline and in 7.0% after introduction of the checklist". Conclusions of the study were that "implementation of the checklist was associated with concomitant reductions in the rates of death and complications among patients at least 16 years of age who were undergoing noncardiac surgery in a diverse group of hospitals." Gawande's 2007 New Yorker article reported on the Keystone Initiative findings. "Within the first three months of the project, the infection rate in Michigan’s I.C.U.s decreased by sixty-six per cent. The typical I.C.U.—including the ones at Sinai-Grace Hospital—cut its quarterly infection rate to zero. Michigan’s infection rates fell so low that its average I.C.U. outperformed ninety per cent of I.C.U.s nationwide. In the Keystone Initiative’s first eighteen months, the hospitals saved an estimated hundred and seventy-five million dollars in costs and more than fifteen hundred lives. The successes have been sustained for almost four years—all because of a stupid little checklist." In Risky Business (hfm Magazine), Chad Mulvany describes how “payment reform will force providers to again embrace a type of operational risk that many have avoided since their experience with capitation in the 1990s." He recently sat down with Healthcare Technology News to describe these changes. HTN: What changes do you anticipate in payment reform and what are the implications? Chad Mulvany: I can see two types of reform that come out and specifically impact reimbursement. The first is across the board payment cuts, such as reductions to DSH (Medicare's Disproportionate Share Hospital) or the market basket update factors. These are essentially untargeted payment cuts. The other type, which is probably more important for the long term, is a reimbursement shift from volume (fee for service model that we're current paid on) more towards a focus on value. Not only are payers looking at a provider's efficiency in providing care, but also the quality level that's provided. This could come in the form of different initiatives. One example would be reduced payments or non-payments for re-admission, another would be value based purchasing where providers that offer higher quality care are reimbursed more. A few more examples would include accountable care organizations and payment bundling for episodes of care. HTN: What types of risk will providers be managing? Chad Mulvany: We’ll continue to manage cost risk. This is the type of risk we've always managed and as an industry we're fairly comfortable with it. We've faced it ever since the implementation of DRG's. There's also quality risk which we've also managed but not in the sense of how it impacts actual payment, but in terms of how it impacts market share. Because traditionally we've been concerned that we were regarded as high quality the perspective that no one wants to go to a low quality hospital. Now it's coming from the perspective of payers, be it Medicare, Medicaid or even your commercial payers are will look to pay high quality providers more at the procedure level. And then the final one is what I would call efficiency risk. It almost gets into population health risk, and bears a resemblance to partial capitation. Both accountable care organizations and episode of care bundling are examples of payment systems that push greater efficiency risk to providers. Hospitals are going to have be very conscious about the level of resources that go into providing care and making sure that the amount of resources is being matched to what the patient needs. For example, in the instance of a hip replacement surgery, making sure someone who is 85 years old and bed-ridden doesn't get the same hip that Lance Armstrong would get. HTN: What can providers do to prepare for this coming change? Chad Mulvany: There are a couple of things to prepare for this change. First and foremost it's going to be imperative for providers to improve integration with physicians. Doctors drive costs through their choices of how care is delivered and they have a tremendous impact on the way patients think about care. So I think it’s important hospitals are better integrated with physicians and that their economic incentives are tightly aligned. This doesn’t have to happen through physician employment. There are a lot of facilities out there that are looking at unique integration structures be it some type of co-management model for a service line or departments paying physicians for example to be an active department director. Or reaching out to community physician leaders and paying them to act as an advisory council to your organization - - obviously you have to be careful of how these arrangements are structured from a Stark perspective. Another thing that providers need to do is to focus on quality improvement. Obviously there’s been a big push for that recently. That's going to extend to looking very critically at why patients are readmitted at your hospitals or drilling down into near misses on never events and things like that squeeze them out of the system. Finally, hospitals should examine their operations not only to make sure they put processes in place to improve quality, but also to squeeze cost out of the system in a systematic manner. Many facilities are finally looking to six-sigma and other process improvement methodologies to achieve this. HTN: This is a big sea change in health care. How quickly will providers shift to managing risk? Chad Mulvany: There are number of very progressive organizations already doing this. These typically are the poster children for what the health care system should look like post-reform. The facilities like Geisinger and Intermountain that are already doing this and doing it extremely well. For the rest of the hospitals in the country though, it’s going to require both the public sector and the private sector to start moving the payment system to a value-based model. which is already happening through any number of demonstration projects. This is both commercial and governmental. When you look at what Blue Cross in Michigan is doing through state-wide value based purchasing, or CMS through the ACE demonstration project, they're already starting to move the paradigm in that direction. We're starting to see that shift happen now and as more of these reforms mature and come to market, it's going to push providers to start thinking that way. So facilities need to be thinking about this today. HTN: How critical is risk management to the profitability of the providers? Chad Mulvany: It's going to be extremely important for providers moving forward to manage quality risk and combine that with cost risk as well. As reimbursement starts moving from volume to value, at the end of the day payers are going to pay for that value - - not "Did you produce X number of services?" but rather "What were the outcomes like?" HTN: And how critical is risk management to the quality of care? Chad Mulvany: It's an imperative. When you think about managing quality, not only is the government looking at this, but you also see the private industry groups like Leapfrog Group with their focus on quality. At the end of the day, I can imagine a world in which not only Medicare and Medicaid are reimbursing based on quality, but you'll also start to see it in managed care contracting. One of the things that I hear from employer groups is that they've gotten to a point where they can no longer afford the rate increases unless they experienced over the last decade unless they see a commensurate improvement in value, essentially an improvement in the quality of care. This is going to make or break health systems moving forward. HTN: It's great when there's such an alignment between costs and patient care. That sounds like good news for health care generally. Chad Mulvany: I would have to agree with you. What's interesting is that the two aren't necessarily divorced - - in fact they're very much linked. I had an opportunity to speak with someone at Scott and White (Hospital and Clinic in Temple Texas) who was talking about their process improvement methodology. I asked if she was coming at it from the perspective of trying to reduce costs. She very specifically corrected me and said no - we look at three things when we look at process improvement. The first question we ask is it going to improve patient safety? Second is it going to improve patient satisfaction? And third is it going to improve employee satisfaction? When we end up fixing something that is a detriment to one of those three things, we find that it eventually ends up reducing costs as well. So the two are very much tied together. HTN: Will these trends accelerate the consolidation of providers? Chad Mulvany: I think it will. When you think about episodic payment or an accountable care organization, you need to have all the pieces in place and a fairly defined system of care. Secondly from a financial perspective, there are a lot of hospitals that are currently struggling financially that are not going to have the capital to make the investments in process improvements. Unfortunately these are not inexpensive investments that need to be made and the way the payment cuts are structured, the financial picture isn’t getting better for these providers. So there will be an opportunity for further health system consolidation. HTN: What is your background and your current role with HFMA? Chad Mulvany: I am the technical manager who's responsible for following reimbursement and regulatory issues. I started out my career as a reimbursement and revenue cycle consultant. From there I was picked up by one of my clients and worked for a large health system doing everything from preparing cost reports to acting as an internal consultant looking. While I was at this particular health system I completed up my MBA and stepped outside of the industry to work as a management consultant for a couple of years. Just last year, I had the opportunity to join HFMA and just couldn't refuse it. HTN: You must be in ‘hyper-drive’ with the current focus on health care reform. What’s it like? Chad Mulvany: I spend a lot of time reading 2000 page bills. It's not so much hyper-drive as periods of very frantic activity whenever something new comes out from the House or the Senate. The way they work they put something out and refine it, and at that point it's sort of a dark period and you don't hear anything from them. Then two to four weeks later something else comes out and it starts again. Remember your high school civics class? You were taught how a bill becomes law. House and Senate pass it and the President signs it into law. Wrong. It's likely that there won't be a conference committee for health care reform. Ping Pong will take its place. Jonathan Cohn at the New Republic reports that senior Capitol Hill staffers confirm that it's "almost certain" that Senate and House Democrats are not going to convene a conference committee. "Doing so would allow Democrats to avoid a series of procedural steps - - not least among them, a series of special motions in the Senate, each requiring a vote with full debate - - that Republicans could use to stall deliberations, just as they did in November and December. There will almost certainly be full negotiations but no formal conference..."
Ping Pong foils Republican maneuvers to stall the Health Care Reform legislation. "With ping-ponging, the chambers send legislation back and forth to one another until they finally have an agreed-upon version of the bill. But even ping-ponging can take different forms and some people use the term generically to refer to any informal negotiations." The Hitech Act provided for incentives to eligible professionals (EP) and hospitals that have adopted Certified EHR Technology and can demonstrate that they are meaningful users of the technology. HHS has published the proposed rule governing the criteria for meaningful use. The criteria for meaningful use will be finalized in 2010, following a 60 day comment period. Extracts of key elements of the proposed rule follow. In Stage 1 beginning in 2011, meaningful use criteria focuses on electronically capturing health information in a coded format; using that information to track key clinical conditions and communicating that information for care coordination purposes (whether that information is structured or unstructured), implementing clinical decision support tools to facilitate disease and medication management and reporting clinical quality measures and public health information. The rule specifies criteria for Stage 1 only and will be the criteria used for all payment years until updated by future rulemaking. It is intended as new criteria are established in 2013 and 2015, that the Stage 1 criteria is applied to the first payment year. Stage 2, beginning in 2013, encourages the use of health IT for continuous quality improvement at the point of care and the exchange of information in the most structured format possible, such as the electronic transmission of orders entered using computerized provider order entry (CPOE) and the electronic transmission of diagnostic test results (such as blood tests, microbiology, urinalysis, pulmonary function tests and other data needed to diagnose and treat disease). Stage 3, beginning in 2015 focuses on promoting improvements in quality, safety and efficiency, focusing on decision support for national high priority conditions, patient access to self management tools, access to comprehensive patient data and improving population health. The adoption of the new HIPAA transactions (5010) and ICD-10 code sets are required as part of the Stage 2 and 3 criteria, following the originally published dates leading to ICD-10 implementation starting October 1, 2013. The use of NCPDP SCRIPT Version 8.1 or 10.6 for e-Prescribing is required. For the first year only, the EHR Reporting period means any continuous 90-day period during that calendar year in which the EP or eligible hospital demonstrates meaningful use of certified EHR technology. Subsequent years require reporting for the entire calendar year. While this suggests that an EP has until October 1, 2011 to begin meaningful use and still receive an incentive for payment year 2011, such a delay by the EP puts at risk the incentive if the provider fails to meet the related performance criteria (for example CPOE used for 80 percent of all EP orders and 10% of all hospital orders) in the final 90 days of 2011. Under HITECH, an EP or eligible hospital is considered a meaningful EHR user if they (1) demonstrate use of certified EHR technology in a meaningful manner, (2) demonstrate that the certified EHR technology is connected in a manner that provides for the electronic exchange of health information to improve the quality of health care such as promoting care coordination and (3) using its certified EHR technology submits information on specified clinical quality measures and other measures. For Medicaid incentives in the initial payment year, the EP or eligible hospital may demonstrate that they have engaged in efforts to adopt, implement or upgrade certified EHR technology. For Medicaid incentives in subsequent payment years, they must demonstrate that they are meaningful users of the certified EHR technology, in a similar manner to the criteria under Medicare, but with states having the option to add additional objectives or to modify how the existing objectives are measured. Each meaningful use objective must be satisfied by an individual EP as determined by unique National Provider Identifiers (NPIs) and an individual hospital as determined by unique CMS certification numbers (CCN). Provide access to comprehensive patient health data for patient's healthcare team. Use evidence-based order sets and computerized provider order entry (CPOE). Apply clinical decision support at the point of care. Generate lists of patients who need care and use them to reach out to those patients. Report information for quality improvement and public reporting. Implement drug-drug, drug-allergy, drug-formulary checks. The EP has enabled this functionality. Maintain an up-to-date problem list of current and active diagnoses based on ICD-9-CM or SNOMED CT®. At least 80 percent of all unique patients seen by the EP have at least one entry or an indication of none recorded as structured data. Generate and transmit permissible prescriptions electronically (eRx). At least 75 percent of all permissible prescriptions written by the EP are transmitted electronically using certified EHR technology. Maintain active medication list. At least 80 percent of all unique patients seen by the EP have at least one entry (or an indication of “none” if the patient is not currently prescribed any medication) recorded as structured data. the EP have at least one entry (or an indication of “none” if the patient has no medication allergies) recorded as structured data. Record and chart changes in the following vital signs: height, weight and blood pressure and calculate and display body mass index (BMI) for ages 2 and over; plot and display growth charts for children 2 - 20 years, including BMI. For at least 80 percent of all unique patients age 2 and over seen by the EP, record blood pressure and BMI; additionally, plot growth chart for children age 2 to 20. Record smoking status for patients 13 years old or older. At least 80 percent of all unique patients 13 years old or older seen by the EP have “smoking status” recorded. Incorporate clinical lab-test results into EHR as structured data. At least 50 percent of all clinical lab tests results ordered by the EP during the EHR reporting period whose results are in either in a positive/negative or numerical format are incorporated in certified EHR technology as structured data. Generate lists of patients by specific conditions to use for quality improvement, reduction of disparities, research, and outreach. Generate at least one report listing patients of the EP with a specific condition. Report ambulatory quality measures to CMS (or, for EPs seeking the Medicaid incentive payment, the States). For 2011, an EP would provide the aggregate numerator and denominator through attestation. For 2012, an EP would electronically submit the quality measures. Implement five clinical decision support rules relevant to specialty or high clinical priority, including for diagnostic test ordering, along with the ability to track compliance with those rules. Clinical decision support is defined as health information technology functionality that builds upon the foundation of an EHR to provide persons involved in care processes with general and person-specific information, intelligently filtered and organized, at appropriate times, to enhance health and health care. An EP should implement five clinical decision support rules relevant to the clinical quality metrics before the end of the EHR reporting period and attest to that implementation. Submit claims electronically to public and private payers. At least 80 percent of all claims filed electronically by the EP. (for example, MD, DO, RN, PA, NP). CPOE is used for at least 10 percent of all orders. Implement drug-drug, drug-allergy, drug-formulary checks. The eligible hospital has enabled this functionality. ICD-9-CM or SNOMED CT®. At least 80 percent of all unique patients admitted to the eligible hospital have at least one entry or an indication of none recorded as structured data. Maintain active medication list. At least 80 percent of all unique patients admitted by the eligible hospital have at least one entry (or an indication of “none” if the patient is not currently prescribed any medication) recorded as structured data. Maintain active medication allergy list. At least 80 percent of all unique patients admitted to the eligible hospital have at least one entry (or an indication of “none” if the patient has no medication allergies) recorded as structured data. mortality. At least 80 percent of all unique patients admitted to the eligible hospital have demographics recorded as structured data. growth charts for children 2 - 20 years, including BMI. For at least 80 percent of all unique patients age 2 and over admitted to the eligible hospital, record blood pressure and BMI; additionally, plot growth chart for children age 2 to 20. Record smoking status for patients 13 years old or older. At least 80 percent of all unique patients 13 years old or older admitted to the eligible hospital have “smoking status” recorded. Incorporate clinical lab-test results into EHR as structured data. At least 50 percent of all clinical lab tests results ordered by an authorized provider of the eligible hospital during the EHR reporting period whose results are in either in a positive/negative or numerical format are incorporated in certified EHR technology as structured data. Generate lists of patients by specific conditions to use for quality improvement, reduction of disparities, and outreach. Generate at least one report listing patients eligible hospital with a specific condition. the Medicaid incentive payment, the States). For 2011, an eligible hospital would provide the aggregate numerator and denominator through attestation. For 2012, an eligible hospital would electronically submit the measures. compliance with those rules. An eligible hospital should implement five clinical decision support rules relevant to the clinical quality metrics before the end of the EHR reporting period and attest to that implementation. Submit claims electronically to public and private payers. At least 80 percent of all claims filed electronically by the eligible hospital. 2. Health outcomes policy priority: Engage patients and families in their healthcare. Provide patients and families with timely access to data, knowledge, and tools to make informed decisions and to manage their health. Provide patients with an electronic copy of their health information (including diagnostics test results, problem list, medication lists, allergies) upon request. Electronic copies may be provided through a number of secure electronic methods (for example, personal health record (PHR), patient portal, CD, USB drive). At least 80 percent of all patients who request an electronic copy of their health information are provided it within 48 hours. Provide clinical summaries for patients for each office visit. Clinical summaries provided to patients for at least 80 percent of all office visits. Provide patients with an electronic copy of their health information (including diagnostic test results, problem list, medication lists, allergies, discharge summary, procedures), upon request. At least 80 percent of all patients who are discharged from an eligible hospital and who request an electronic copy of their discharge instructions and procedures are provided it. Provide patients with an electronic copy of their discharge instructions and procedures at time of discharge, upon request. 3. Health outcomes policy priority: Improve care coordination. Capability to exchange key clinical information (for example, problem list, medication list, allergies, and diagnostic test results), among providers of care and patient authorized entities electronically. Performed at least one test of certified EHR technology's capacity to electronically exchange key clinical information. To be considered an “exchange” in this section alone the clinical information must be sent between different clinical entities with distinct certified EHR technology and not between organizations that share a certified EHR. Perform medication reconciliation at relevant encounters and each transition of care. Perform medication reconciliation for at least 80 percent of relevant encounters and transitions of care. Provide summary care record for each transition of care or referral. Provide summary of care record for at least 80 percent of transitions of care and referrals. The patient's health care team communicates with public health agencies. Capability to submit electronic data to immunization registries and actual submission where possible and accepted. Performed at least one test of certified EHR technology's capacity to submit electronic data to immunization registries. Capability to provide electronic syndromic surveillance data to public health agencies and actual transmission according to applicable law and practice. Performed at least one test of certified EHR technology's capacity to provide electronic syndromic surveillance data to public health agencies (unless none of the public health agencies to which an EP or eligible hospital submits such information have the capacity to receive the information electronically). More stringent requirements may be established for EPs and hospitals under the Medicaid program in States where this capability exists. This is just one example of a possible State proposed modification to meaningful use in the Medicaid EHR incentive program. States may propose any modification or addition to CMS in accordance with the discussion in II.A.2.c. of this proposed rule. Capability to submit electronic data to immunization registries and actual submission where required and accepted. Capability to provide electronic submission of reportable (as required by state or local law) lab results to public health agencies and actual submission where it can be received. Performed at least one test of certified EHR technology capacity to provide electronic submission of reportable lab results to public health agencies (unless none of the public health agencies to which eligible hospital submits such information have the capacity to receive the information electronically). Capability to provide electronic syndromic surveillance data to public health agencies and actual transmission according to applicable law and practice. Performed at least one test of certified EHR technology's capacity to provide electronic syndromic surveillance data to public health agencies (unless none of the public health agencies to which an EP or eligible hospital submits such information have the capacity to receive the information electronically). 5. Health outcomes policy priority: Ensure adequate privacy and security protections for personal health information. Ensure privacy and security protections for confidential information through operating policies, procedures, and technologies and compliance with applicable law. Provide transparency of data sharing to patient. Protect electronic health information created or maintained by the certified EHR technology through the implementation of appropriate technical capabilities. The intent is to ensure that meaningful use of the certified EHR technology supports compliance with the HIPAA Privacy and Security Rules and compliance with fair sharing data practices outlined in the Nationwide Privacy and Security Framework. However, meaningful use of certified EHR technology is not the appropriate regulatory tool to ensure such compliance with the HIPAA Privacy and Security Rules. EPs and eligible hospitals conduct or review a security risk analysis of certified EHR technology and implement security updates as necessary at least once prior to the end of the EHR reporting period and attest to that conduct or review. The testing could occur prior to the beginning of the EHR reporting period. Many of the measures listed above require denominators which track manual activity (e.g., the number of orders that were written outside of the EHR). Also, providers working in multiple locations and with multiple EHR's need to have this information combined for CMS reporting. Not clear how this works for providers working across multiple organizations with separate EHRs. Starting in 2011, to be a meaningful user, EPs and eligible hospitals will be required to use certified EHR technology to capture the data elements and calculate the results for the applicable clinical quality measures. EPs and eligible hospitals must demonstrate that they have satisfied this requirement during the EHR reporting period for 2011 through attestation. Medicare EPs and eligible hospital attest to the accuracy and completeness of the numerators and denominators for each of the applicable measure. EPs and eligible hospitals must demonstrate their use of certified EHR technology to capture the data elements and calculate the results for the applicable clinical quality measures by reporting the results to CMS for all applicable patients. For the Medicaid incentive program, States may accept provider attestations in the same manner to demonstrate meaningful use in 2011. However, we expect that Medicaid providers will qualify for the incentive payment by adopting, implementing, or upgrading to certified EHR technology, and therefore; will not need to attest to meaningful use of EHRs in 2011, for their first payment year. Stroke and Stroke Rehabilitation: Computed Tomography (CT) or Magnetic Resonance Imaging (MRI) Reports - Percentage of final reports for CT or MRI studies of the brain performed within 24 hours of arrival to the hospital for patients aged 18 years and older with either a diagnosis of ischemic stroke or transient ischemic attack (TIA) or intracranial hemorrhage or at least one documented symptom consistent with ischemic stroke or TIA or intracranial hemorrhage that includes documentation of the presence or absence or each of the following: hemorrhage and mass lesion and acute infarction. Initiation and Engagement of Alcohol and Other Drug Dependence Treatment: (a) Initiation, (b) Engagement - Percentage of adults aged 18 and over diagnosed with AOD abuse or dependence and receiving a related service who initiate treatment Assessment of the degree to which members engage in treatment with two additional AOD treatments within 30 days after initiating treatment. Blood pressure measurement - Percentage of patient visits with blood pressure measurement recorded among all patient visits for patients aged > 18 years with diagnosed hypertension. Drugs to be avoided in the elderly: a. Patients who receive at least one drug to be avoided, b. Patients who receive at least two different drugs to be avoided. - Percentage of patients ages 65 years and older who received at least one drug to be avoided in the elderly in the measurement year. Percentage of patients 65 years of age and older who received at least two different drugs to be avoided in the elderly in the measurement year. Measure pair - a. Tobacco use prevention for infants, children and adolescents, b. Tobacco use cessation for infants, children and adolescents - Percentage of patients' charts showing either that there is no tobacco use/exposure or (if a user) that the current use was documented at the most recent clinic visit. Percentage of patients with documented tobacco use or exposure at the latest visit who also have documentation that their cessation interest was assessed or that they received advice to quit. Cervical Cancer Screening - Percentage of women 18-64 years of age, who received one or more Pap tests during the measurement year or the 2 years prior to the measurement year. Chlamydia screening in women - Percentage of eligible women who were identified as sexually active who had at least one test for chlamydia during the measurement year. Use of appropriate medications for people with asthma - Percentage of patients who were identified as having persistent asthma during the measurement year and the year prior to the measurement year and who were dispensed a prescription for either an inhaled corticosteroid or acceptable alternative medication during the measurement year. Childhood Immunization Status - Percentage of children 2 years of age who had four DtaP/DT, three IPV, one MMR, three H influenza type B, three hepatitis B, one chicken pox vaccine (VZV) and four pneumococcal conjugate vaccines by their second birthday. The measure calculates a rate for each vaccine and two separate combination rates. who received an imaging study (plain x-ray, MRI, CT scan) conducted on the episode start date or in the 28 days following the episode start date. Hemoglobin A1c test for pediatric patients - Percentage of pediatric patients with diabetes with a HBA1c test in a 12-month measurement period. New Episode of Depression: (a) Optimal Practitioner Contacts for Medication Management, (b) Effective Acute Phase Treatment,(c)Effective Continuation Phase Treatment - Percentage of patients who were diagnosed with a new episode of depression and treated with antidepressant medication, and who had at least three follow-up contacts with a practitioner during the 84-day (12-week) Acute Treatment. Phase b. Percentage of patients who were diagnosed with a new episode of depression, were treated with antidepressant medication and remained on an antidepressant drug during the entire 84-day Acute Treatment. Phase c. Percentage of patients who were diagnosed with a new episode of depression and treated with antidepressant medication and who remained on an antidepressant drug for at least 180 days. Diagnosis of attention deficit hyperactivity disorder (ADHD) in primary care for school age children and adolescents - Percentage of patients newly diagnosed with attention deficit hyperactivity disorder (ADHD) whose medical record contains documentation of Diagnostic and Statistical Manual of Mental Disorders, Fourth Edition (DSM-IV) or Diagnostic and Statistical Manual for Primary Care (DSM-PC) criteria being addressed. Management of attention deficit hyperactivity disorder (ADHD) in primary care for school age children and adolescents - Percentage of patients diagnosed with attention deficit hyperactivity disorder (ADHD) and on first-line medication whose medical record contains documentation of a follow-up visit twice a year. ADHD: Follow-Up Care for Children Prescribed Attention-Deficit/Hyperactivity Disorder (ADHD) Medication. - a. Initiation Phase: Percentage of children 6 – 12 years of age as of the Index Prescription Episode Start Date with an ambulatory prescription dispensed for and ADHD medication and who had one follow-up visit with a practitioner with prescribing authority during the 30-Day Initiation. Phase b. Continuation and Maintenance (C&M) Phase: Percentage of children 6 – 12 years of age as of the Index Prescription Episode Start Date with an ambulatory prescription dispensed for ADHD medication who remained on the medication for at least 210 days and who in addition to the visit in the Initiation Phase had at least two additional follow-up visits with a practitioner within 270 days (9 months) after the Initiation Phase ends. Surgical Site Infection Rate - Percentage of surgical site infections occurring within thirty days after the operative procedure if no implant is left in place or with one year if an implant is in place in patients who had an NHSN operative procedure performed during a specified time period and the infection appears to be related to the operative procedure. Cesarean Rate for low-risk first birth women (aka NTSV CS rate) - Percentage of low-risk first birth women (aka NTSV CS rate: nulliparous, term, singleton, vertex) with a Cesarean rate that has the most variation among practicioners, hospitals, regions and states. Unlike other cesarean measures, it focuses attention on the proportion of cesarean births that is affected by elective medical practices such as induction and early labor admission. Furthermore, the success (or lack thereof) of management of the first labor directly impacts the remainder of the woman's reproductive life (especially given the current high rate of repeat cesarean births). measures and the subset of clinical measures most appropriate given the EPs specialty. Core measures include 1) preventive care and screening: inquiry regarding tobacco use, 2) blood pressure measurement, and 3) Drugs to be avoided in the elderly. The second required measure set for each EP is to submit information on at least one of the sets of measures for specialty groups. The specialty groups are Cardiology, Pulmonology, Endocrinology, Oncology, Proceduralist/Surgery, Primary Care Physicians, Pediatrics, Obstetrics and Gynecology, Neurology, Psychiatry, Ophthalmology, Podiatry, Radiology, Gastroenterology, and Nephrology. The denominator of clinical quality measures and the applicability of a measure is determined by the patient population to whom the measure applies and the services rendered by the particular EP. Ischemic stroke – Anticoagulation for A-fib/flutter - Ischemic stroke patients with atrial fibrillation/flutter who are prescribed anticoagulation therapy at hospital discharge. Ischemic stroke – Thrombolytic therapy for patients arriving within 2 hours of symptom onset - Acute ischemic stroke patients who arrive at this hospital within 2 hours of time last known well and for whom IV t-PA was initiated at this hospital within 3 hours of time last known well. Ischemic or hemorrhagic stroke – Antithrombotic therapy by day 2 - Ischemic stroke patients administered antithrombotic therapy by the end of hospital day 2. Ischemic stroke – Discharge on statins - Ischemic stroke patients with LDL > 100 mg/dL, or LDL not measured, or, who were on a lipid-lowering medication prior to hospital arrival are prescribed statin medication at hospital discharge. Ischemic or hemorrhagic stroke – Stroke education - Ischemic or hemorrhagic stroke patients or their caregivers who were given educational materials during the hospital stay addressing all of the following: activation of emergency medical system, need for follow-up after discharge, medications prescribed at discharge, risk factors for stroke, and warning signs and symptoms of stroke. Ischemic or hemorrhagic stroke – Rehabilitation assessment - Ischemic or hemorrhagic stroke patients who were assessed for rehabilitation services. VTE prophylaxis within 24 hours of arrival - This measure assesses the number of patients who received VTE prophylaxis or have documentation why no VTE prophylaxis was given the day of or the day after hospital admission or surgery end date for surgeries that start the day of or the day after hospital admission. ICU VTE prophylaxis - This measure assesses the number of patients who received VTE prophylaxis or have documentation why no VTE prophylaxis was given the day of or the day after the initial admission (or transfer) to the Intensive Care Unit (ICU) or surgery end date for surgeries that start the day of or the day after ICU admission (or transfer). Anticoagulation overlap therapy - This measure assesses the number of patients diagnosed with confirmed VTE who received an overlap of parenteral (intravenous [IV] or subcutaneous [subcu]) anticoagulation and warfarin therapy. For patients who received less than five days of overlap therapy, they must be discharged on both medications. Overlap therapy must be administered for at least five days with an international normalized ratio (INR) ≥ 2 prior to discontinuation of the parenteral anticoagulation therapy or the patient must be discharged on both medications. Platelet monitoring on unfractionated heparin - This measure assesses the number of patients diagnosed with confirmed VTE who received intravenous (IV) UFH therapy dosages AND had their platelet counts monitored using defined parameters such as a nomogram or protocol. VTE discharge instructions - This measure assesses the number of patients diagnosed with confirmed VTE that are discharged to home, to home with home health, home hospice or discharged/transferred to court/law enforcement on warfarin with written discharge instructions that address all four criteria: compliance issues, dietary advice, follow-up monitoring, and information about the potential for adverse drug reactions/interactions. Incidence of potentially preventable VTE - This measure assesses the number of patients diagnosed with confirmed VTE during hospitalization (not present on arrival) who did not receive VTE prophylaxis between hospital admission and the day before the VTE diagnostic testing order date. Blood Cultures Performed in the Emergency Department Prior to Initial Antibiotic Received in Hospital - Pneumonia patients whose initial emergency room blood culture specimen was collected prior to first hospital dose of antibiotics. This measure focuses on the treatment provided to Emergency Department patients prior to admission orders. Angiotensin Converting Enzyme Inhibitor (ACEI) or Angiotensin Receptor Blocker (ARB) for Left Ventricular Systolic Dysfunction (LVSD) - Acute myocardial infarction (AMI) patients with left ventricular systolic dysfunction (LVSD) who are prescribed an ACEI or ARB at hospital discharge. For purposes of this measure, LVSD is defined as chart documentation of a left ventricular ejection fraction (LVEF) less than 40% or a narrative description of left ventricular systolic (LVS) function consistent with moderate or severe systolic dysfunction. Infection SCIP Inf-2 Prophylactic antibiotics consistent with current recommendations - Surgical patients who received prophylactic antibiotics consistent with current guidelines (specific to each type of surgical procedure). All-Cause Readmission Index (risk adjusted) - Overall inpatient 30-day hospital readmission rate. All-Cause Readmission Index - Overall inpatient 30-day hospital readmission rate. Iotrogenic pneumothorax in non-neonates (pediatric up to 17 years of age) - Percent of medical and surgical discharges, age under 18 years, with ICD-9-CM code of iatrogenic pneumothorax in any secondary diagnosis field. Pneumonia Care PN-6 Antibiotic selection - Percentage of pneumonia patients 18 years of age or older selected for initial receipts of antibiotics for community acquired pneumonia (CAP). Pneumonia Care PN-3a Blood culture - Percent of pneumonia patients, age 18 years or older, transferred or admitted to the ICU within 24 hours of hospital arrival who had blood cultures performed within 24 hours prior to or 24 hours after arrival at the hospital. Infection SCIP Inf-1 Prophylactic antibiotic received within 1 hour prior to surgical incision - Surgical patients with prophylactic antibiotics initiated within 1 hour prior to surgical incision. Patients who received vancomycin or a fluoroquinolone for prophylactic antibiotics should have the antibiotics initiated within 2 hours prior to surgical incision. Due to the longer infusion time required for vancomycin or a fluoroquinolone, it is acceptable to start these antibiotics within 2 hours prior to incision time. Infection SCIP Inf-3 Prophylactic antibiotics discontinued within 24 hours after surgery end time - Surgical patients whose prophylactic antibiotics were discontinued within 24 hours after Anesthesia End Time. Medicare EPs and eligible hospitals would be required to report the required clinical quality measures information electronically using certified EHR technology via one of three methods. The primary method would require the EP or eligible hospital to log into a CMS-designated portal. Once the EP or eligible hospital has logged into the portal, they would be required to submit, through an upload process, data payload based on specified structures, such as Clinical Data Architecture (CDA), and accompanying templates produced as output from their certified EHR technology. As an alternative to this data submission method, Medicare EPs and eligible hospitals may submit the required clinical quality measures data using certified EHR technology through Health Information Exchange (HIE)/Health Information Organization (HIO). This alternative data submission method would be dependent on the Secretary's ability to collect data through a HIE/HIO network and would require the EP or eligible hospital who chooses to submit data via an HIE/HIO network to be a participating member of the HIE/HIO network. Medicare EPs and eligible hospitals would be required to submit their data payload based on specified structures or profiles, such as Clinical Data Architecture (CDA), and accompanying templates. The EP's or eligible hospital's data payload should be an output from their respective certified EHR products, in the form and manner specified from their HIE/HIO adopted architecture into the CMS HIE/HIO adopted architecture. As another potential alternative, submission be accepted through registries dependent upon the development of the necessary capacity and infrastructure to do so using certified EHRs. For CY 2011 and FY 2011, EPs and eligible hospitals demonstrate that they satisfy each of the proposed meaningful use objectives through attestation. For payment years beginning in CY and FY 2012 and subsequent years, EPs and eligible hospitals demonstrate that they satisfy each of the proposed quality measures through electronic reporting and the remainder through attestation. Incentives will be made at the EP level, not at the group practice level. EPs that change practices may continue their incentive payments at their new practice. EP's that no longer qualify for Medicaid incentives due to such a change, may elect a one-time change to the Medicare program. Name, NPI, business address, and business phone of each EP or eligible hospital. For EPs, whether they elect to participate in the Medicare EHR incentive programs or the Medicaid EHR incentive program. For eligible hospitals, their CCN. Hospital-based Professionals are not eligible for the Medicare incentive payments. Most are also not eligible for Medicaid, unless they practice predominantly in an FQHC or RHC. A Professional is considered hospital-based if substantially all (90%) of the professional services are in the inpatient or outpatient hospital settings, based on the place of service (POS) codes on physician claims. Stage 1 meaningful use criteria for eligible hospitals apply to the hospital's inpatient setting only. If a Medicare FFS or MA EP receives an incentive payment from the Medicare EHR incentive program, the EP (or group practice) is not eligible to also receive the incentive payment under the E-prescribing Incentive Program created by MIPPA. EPs receiving a Medicaid EHR incentive payment would remain eligible for the Medicare MIPAA E-Prescribing Incentive Program payment. An Eligible Professional is one of five types of professionals, each of which must be legally authorized to practice their profession under state law: a doctor of medicine or osteopathy, a doctor of dental surgery or dental medicine, a doctor of podiatric medicine, a doctor of optometry, or a chiropractor. For EPs working with more than one practice, the EP selects one tax identification number to receive the applicable EHR incentive payment. EPs that provide service in designated HPSA's are entitled to an increased incentive payment limit of 10 percent per year. EP's that provider more than 50% of their service in an HPSA (for claims submitted within 60 days of calendar year-end) and otherwise meet the meaningful use requirements are entitled to the increased incentive payment. These adjustments (penalties) start in 2015 for EPs who are not Meaningful Users of Certified EHR Technology. Beginning in 2015, if an EP is not a meaningful EHR user for any EHR reporting period for the year, then the Medicare physician fee schedule is adjusted by the applicable percent': “(I) for 2015, 99 percent (or, in the case of an EP who was subject to the application of the payment adjustment if the EP is not a successful electronic prescriber under section 1848(a)(5) for 2014, 98 percent);” “(II) for 2016, 98 percent; and (III) for 2017 and each subsequent year, 97 percent.” In addition, if for 2018 and subsequent years the Secretary finds that the proportion of EPs who are meaningful EHR users is less than 75 percent, the applicable percent shall be decreased by 1 percentage point from the applicable percent in the preceding year, but in no case shall the applicable percent be less than 95 percent. There is a significant hardship exception which cannot exceed 5 additional years. The hospital payment methodology starts with an initial amount calculated as a base amount ($2 million) and adds a discharge related amount based on the number of discharges for the period ($200 for discharges from 1,150 up to 23,000 discharges). The initial amount is then multiplied by the Medicare Share and an applicable transition factor to determine the incentive payment for an incentive payment year. Adjustments to the market basket update to the IPPS payment rate will be made for hospitals that are not meaningful users by 2015. A qualifying MA organization may receive an incentive payment for EP's that are employed by the qualifying MA organization; or are employed by, or be a partner of, an entity that through contract with the qualifying MA organization furnishes at least 80 percent of the entity's Medicare patient care services to enrollees of the qualifying MA organization. Further, the EP must furnish at least 80 percent of his or her professional services covered under Medicare to enrollees of the qualifying MA organization and must furnish, on average, at least 20 hours per week of patient care services during the EHR reporting period. The payment rules for MA organizations are beyond the scope of this article. Medicaid Program Participation A “Medicaid EP” is a Medicaid professionals including : physicians, dentists, certified nurse-midwives, nurse practitioners, and physician assistants practicing in an FQHC or RHC that is so led by a physician assistant. Additionally, to qualify for incentives, most Medicaid EPs cannot be hospital-based, unless practicing in an FQHC or RHC. 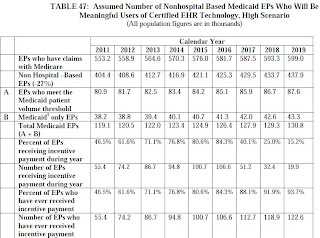 Medicaid EPs must also meet the patient volume thresholds or practice predominantly in an FQHC or RHC. Medicaid EPs must have at least 30 percent patient volume attributable to those who are receiving Medicaid (20 percent for pediatricians). Acute care hospitals and separately certified children's hospitals are eligible under the Medicaid program if they have at least 10% of Medicaid patient volume, but not long-term care facilities (where the average length of patient stay is greater than 25 days). Calculation of the 30 percent of all patient encounters is attributable to needy individuals over any continuous 90-day period within the most recent calendar year prior to reporting. Needy individuals include: (1) they are receiving medical assistance from Medicaid or the Children's Health Insurance Program (CHIP); (2) they are furnished uncompensated care by the provider; or (3) they are furnished services at either no cost or reduced cost based on a sliding scale determined by the individual's ability to pay. Medicaid EPs may voluntarily assign payments to entities promoting EHR technology so long as the assignee does not retain more than 5 percent of the Medicaid incentive payments for costs unrelated to certified EHR technology. Health information exchanges are one example of such entities and have the potential to transform the healthcare system by facilitating timely, accurate, and portable health information on each patient at the point of service. HIEs provide the capability to move clinical information electronically between disparate health care information systems while maintaining the meaning of the information being exchanged. HIEs also provide the infrastructure for secondary use of clinical data for purposes such as public health, clinical, biomedical, and consumer health informatics research as well as institution and provider quality assessment and improvement, where permissible under HIPAA and other requirements included in the HITECH Act. In addition, use of health information exchange models can reduce the need for costly point-to-point interfaces between different EHR tools, as used in laboratories and pharmacies, thus providing a more scalable model of interoperable health information exchange. HIEs promote adoption of certified EHR technology by providing the infrastructure for providers' EHRs to reach outside of their clinical practice sites and connect with other points of care. Providers report that having a more complete picture of their patients' healthcare data from other providers and care settings is one of the primary appeals to using EHRs. Without health information exchange, electronic health records are simply digitized filing cabinets and will not achieve their quality of care or cost containment potential. Furthermore, given the proposed definition of meaningful use, HIEs can significantly help Medicaid providers adopt and use EHR in such a way that the goals of the incentive program are met. The inclusion in HITECH of HIE grants to be awarded to States or State-designated Entities by ONC are an additional indication of the symbiotic relationship between health information exchanges and optimal use of EHRs. Unlike the Medicare incentive programs, the Medicaid program allows eligible providers to receive an incentive payment even before they have begun to meaningfully use certified EHR technology. These providers may receive a first year of payment if they are engaged in efforts to “adopt, implement, or upgrade” to certified EHR technology. “Implement” means that the provider has installed certified EHR technology and has started using the certified EHR technology in his or her clinical practice. Implementation activities would include staff training in the certified EHR technology, the data entry of their patients' demographic and administrative data into the EHR, or establishing data exchange agreements and relationships between the provider's certified EHR technology and other providers, such as laboratories, pharmacies, or HIEs. “Upgrade” means the expansion of the functionality of the certified EHR technology, such as the addition of clinical decision support, eprescribing functionality, CPOE or other enhancements that facilitate the meaningful use of certified EHR technology. A Medicaid EP would not need to demonstrate that it has adopted, implemented, or upgraded certified EHR technology in year one of the program, if they can already demonstrate meaningful use of such technology.